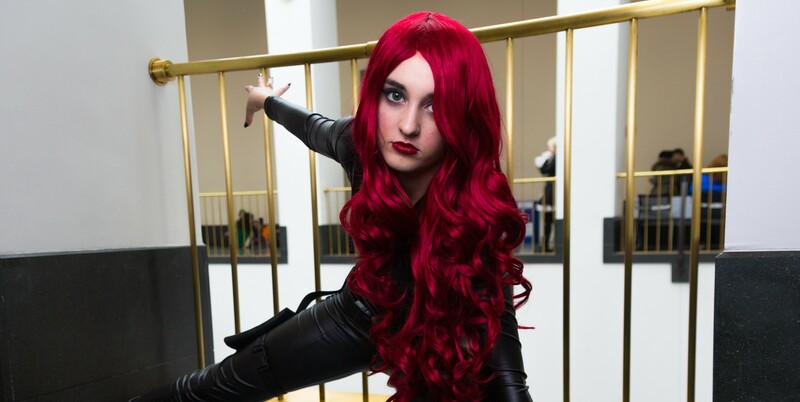 Home » PCU Zeitgeist » Cosplay Life » Cosplay Spotlight: Kayla C.! First name and last initial: Kayla C.
Where are you from originally, or where do you currently reside? Stoneham, MA. Which characters have you cosplayed? Lady Loki, Scarlet Witch, Female Winter Soldier, Black Widow, Pepper Potts, and Female Tony Stark. Who or what inspired you to cosplay? For as long as I was in fandom I have wanted to cosplay. For a long time, I would just look at pictures of other people’s costumes or watch CMVs and think, “Wow I wish I could do that,” but I never did. Until one day I kind of just decided that I had watched this from afar long enough. This was something that I could actually do if I stopped procrastinating and put some effort into it instead of just sitting around. I decided to just buy a ticket to a convention and go for it. It was definitely one of the best decisions that I’ve ever made. What do you do when you aren’t cosplaying? When I’m not cosplaying, I’m a college student working on my degrees towards History and Strategic Communications. While being a double major with a minor takes up most of my time, I always find some spare moment to hang out with my friends and go on adventures with them. I also enjoy reading, writing, running, but only outside; I hate treadmills. I’m also a huge Boston Bruins fan so you’ll catch me yelling at the TV while the game is on. What costumes have provided the biggest challenge and rewards so far and why? My winter soldier costume is definitely one of my favorites, but the arm was a bit of a challenge. Most of the ways to make it were extremely expensive or required a 3D printer. I had to find a cost-effective way to make it that still looked good. Once I realized that you could use craft foam, I called a friend over who had worked with foam before and they helped me make it. Another challenge is walking around the con floor decked out in all leather and a muzzle. I actually had to buy a new muzzle at Boston Comic Con this year because the other one cut into my nose so much that it was starting to break skin. But it was well worth it to be able to cosplay my favorite character and see peoples’ reaction to it. What is the best advice you would give someone new to cosplaying? Just go for it! Cosplay is for you, not for anyone else. As long as you like your costume and you’re having fun, don’t listen to anything negative that anyone else might have to say! But please remember both for yourself and others: Cosplay is NOT Consent. Just because someone is dressed in a skimpy outfit it does not give anyone the right to touch them or harass them. Everybody is here to have a good time; let’s keep it a fun and safe environment for everyone. What is one thing the cosplaying community can do better when it comes to dealing with each other? Definitely the drama and people being pretentious about cosplay. Everyone starts out somewhere and some peoples’ costumes might not be as detailed as others’ and that’s okay! No one needs to be called out or bullied because of it. Honestly, guys, we’re all just nerds trying to have fun and express our love for our favorite characters.